A group of industrial engineering students recently traveled to Des Moines to present their research to lawmakers, media members, and other members of the public at the capitol. Undergraduate research assistants from industrial and manufacturing systems engineering (IMSE) assistant professor Hantang Qin’s Flexible Electronics and Additive Printing (FEAP) Lab visited the statehouse on April 3 to share their research for the 13th annual Research at the Capitol event. The event included 60 projects, with 20 from each of Iowa’s three regent universities. 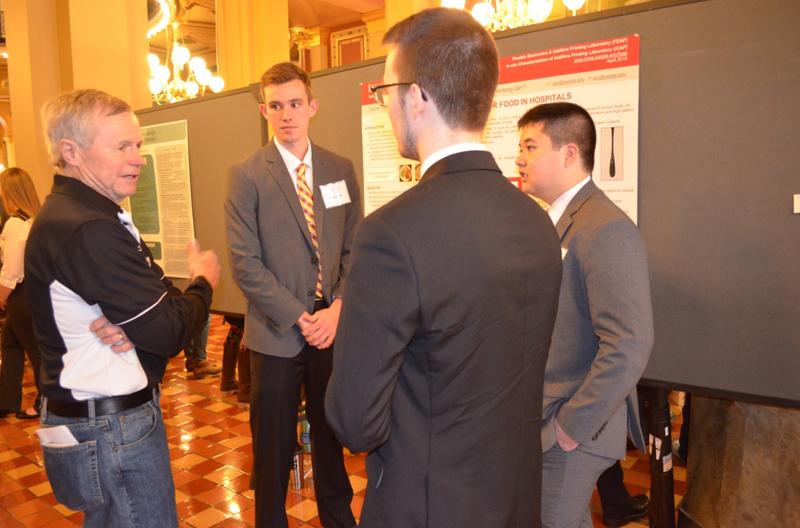 One of the Iowa State groups consisted of Qin along with Kevin Lin, Eric Spahr, and Tanner Spies, all of whom are seniors in industrial engineering. 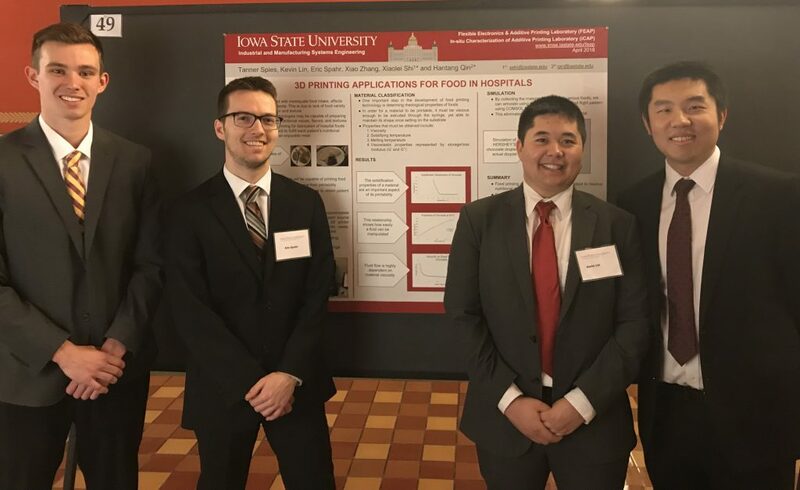 The group’s project – entitled “Application of 3D printing to food preparation at Ames hospitals” – can have an impact in Iowa and more broadly. “Our research project is about 3D food printing in hospitals. We believe that use of 3D printer food in hospitals has the capability of improving the lives of those in Iowa hospitals. Also, we use a lot of corn and soy based products which are the main crops here in Iowa,” Lin said. The atmosphere at the event was lively as dozens of people rotated in and out of the rotunda in the state’s 131-year old capitol building. This project was a collaboration between IMSE and adjunct assistant professor Xiaolei Shi from Iowa State’s Food Science and Human Nutrition Department. Lin said he enjoyed the opportunity to present their research to an audience outside of Ames. “I think that sharing our research with lawmakers, media members, and the public is just as important as sharing it with other researchers. We are funded by taxpayers, as well as lawmakers, and if they are able to see that their contribution is making an impact on us as aspiring researchers, as well as the lives of the people we impact, then they will be more inclined to help us in the future,” Lin said, adding that they had the opportunity to speak with Sen. Herman C. Quirmbach, an associate professor of economics at Iowa State who represents Iowa’s 23rd district which includes Ames and other parts of Story County. Qin said he was proud of the way his students presented themselves and the department throughout the event. He said he thought this was a great opportunity for his students and would be receptive to bringing another group back to Des Moines in the future. Good job, I am really proud of you guys!